The Book of Common Moments: What To Do Now? No use beating around the bush. The Presidential election has upended the entire country. Some rejoice. Some grieve. Some are on fire with rage. Others are trying to find some way to be positive. What’s a Christian to do? No, let me rephrase that. What are you to do? And does Christian faith have anything to offer you in your response? You do indeed have a response, and you are already making it and will continue to do so, though you may shift a bit here and there. Keeping silent is a response. Wait-and-see is a response. Spewing vitriol is a response. Saying “I told you so” is a response. Gloating is a response. So is desperation. Sermons are not the place to dissect election returns. Nor, for my money, are they the place to moralize or paper over difficult things with pious platitudes. But sermons are a place, one would hope, for telling the truth. My purpose is to tell you some truth. Nothing of what I am about to say is anything more or less than my attempt to tell you what I believe to be the truthful answer to one question: what does Christian faith have to offer you in your response to this election’s results? Generally speaking, we are not fond of seeing the institutions that we revere and respect dismantled stone by stone. We don’t do well seeing the things we’ve worked and prayed and sacrificed for and sometimes given our lives to trashed and smashed by those who either do not understand or who do understand yet repudiate the very values that guide the building of communal fabric that through symbol and sacred promise bind the quarrelsome human family together. 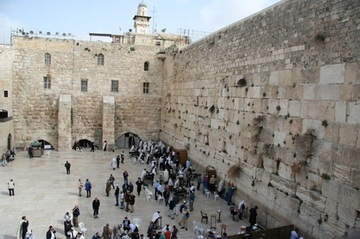 Sometimes reality dishes up the tragic vision of us standing before the ruins of a once noble civilization with little left to do but weep and wail and gnash our teeth, sticking prayers of grief and sadness into the crevices between the few stones left standing, bleak reminders of what once was and is no more. So it is that Christian faith says clearly that God is not a tribal deity synonymous with this or that political position—or doctrinal position for that matter. Precisely one of the things that this election has exposed is the extent to which large numbers of Christians imagine God to be exactly that. What we can say with firm assurance is that God as revealed in Jesus Christ cares inexhaustibly for the weak, the poor, the outcast. We may be wrong about justice and truth, but it is never wrong to seek diligently to know and to do them. We may be ever so wrong about mercy and how to show it, but to be committed to a life marked by mercy and all its allies—kindness, goodness, gentleness, self-control, compassion—is never wrong, for those are exactly the qualities and virtues that our courteous Lord embodies and manifests. We do not have to be in doubt about the will of God when we focus on the model we have in Jesus. Learning how to live not just like him but in him is the point of all Christian practice, from prayer to political action. And being in Christ is exactly the strength and compass for just such an hour as this. That brings me to the next thing that Christian faith says to those of us who are looking for some way to appropriate this election. What we do and how we react is greatly important. It matters. Will being hated we give way to hating? Will we add to the total anger and madness in the world? Will we succumb to the very divisiveness and contentiousness that for a long while have been waiting anxiously for an opening to ascend the throne? Let me be clear. Refusing to hate does not mean capitulating to the forces of repression and destruction. Refusing to hate is not the same as acting nice. And refusing to hate is certainly not the same as refusing to do anything. No. The alternative to hating is to organize, to keep the pressure on, to use every legitimate tool to fight injustice, to stand up audibly and visibly for the powerless and dispossessed. Those are not political strategies derived from a left-wing playbook; they are actions derived from the God of the Bible who always, always comes down on the side of the poor and defenseless. Don’t ever forget that the Jesus who took on the scribes and Pharisees of his day, calling them out on hypocrisy and a totally manipulative reading of their very own Tradition is the same Jesus who taught us to love our enemies, to pray for those who persecute us. The most twisted and diabolical souls that we despise are the very ones to teach us that no one is below—or above—the need of prayer. I didn’t make that up, nor could I. It is not some obscure passage stuck in a small book of a minor prophet, but in the Sermon on the Mount from our Lord himself. 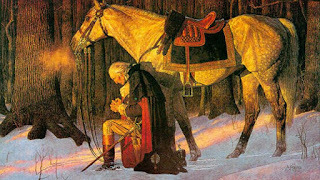 Arnold Friberg, "The Prayer at Valley Forge"
A few days before the election, Joe’s nephew was visiting us from Texas. We took the occasion to go to Mount Vernon. I had not been to Washington’s home since I was a child, and was excited to make this long deferred pilgrimage to the grounds where one of America’s saints lived and died. I think the thing that impressed me most at Mount Vernon was the grace and candor with which the story of slaves there is now told to the public. One could fault Washington for his complicity in that system which he himself grew to question as time went on. But somehow we find it in ourselves to forgive people like that because we know that on balance their character and commitments were such that even what we now see as their part in a tragic darkness does not eclipse the good that they did. And where did that good spring from? It arose and flourished from the roots of faith, watered by prayer, informed by scripture, nourished by sacrament, practiced through discipline. It was not that Washington was or is an example only of a faith that is narrowly Christian, much less that he was flawless, but that his Christian faith molded him into a man who manifested strength and gentleness, efficiency and good humor, dedication and profound humility. Your task now and mine is not to be a Washington, but to manifest authentically, as he did, the marks of what we profess and confess. Our vocation is the same today as it was last Sunday or the one before that or what it was on the day we were baptized and what it will be on the day we die: to do justice, to love mercy, and to walk humbly with God. James Russell Lowell, “The Present Crisis,” in the Harvard Classics, English Poetry III, from Tennyson to Whitman, online at http://www.bartleby.com/42/805.html, accessed 12 November 2016. William Cowper, “God moves in a mysterious way,” The Hymnal 1982 (New York: Church Hymnal Corporation), 677. And I in need of your support, dear friend. Thanks for caring.